When we got our first clutch of chicks, we intended for them to be meat birds as well as layers. We tried not to name them but ran into a problem, whenever a chick did something cute or funny that we wanted to share we had no way of referring to them. Twenty-three turned out to be one of five white Leghorn chickens. The rest were brown and Buff Cochins. For the white chickens, we worked down from 23, giving each a number. We thought we were clever by using numbers as if we could have our eggs and eat it too, but it didn’t work. Through our first flock, we learned that chickens are smart (we believe that like parrots, chickens have the intelligence of a young child), they have different personalities and are just as capable of receiving and giving love as any other being. One of the white hens that became our first house chook was called Twenty. Twenty had opened our hearts, and she was incredibly smart. Twenty was able to learn new things after being shown just once. Twenty learned where she was allowed to lay eggs and sleep in our home, where she should wait outside to get our attention for entry into the house, and that the kitchen is an excellent place to hang out for special treats the other chickens wouldn’t have access to. Twenty also became a companion animal who choose to spend time with us when she had plenty of roaming space available. This realisation is when the “numbers game” stopped. Some of the first chicks we bred ourselves. Whether you name your birds or not, in all likelihood it will not completely mitigate the difficulty of taking their life (especially for the first time). If you have a lot of birds, numbering in hundreds, thousands, and above, then it becomes a bit easier as it is impossible to name them all and get to know them in the same way as a backyard chicken keeper with smaller flocks. What it comes down to is having compassion for your birds. To treat them well, whether you cull them or not, no matter how long their lives are. Taking a life is not supposed to be easy. Closing your heart to the infinite love and joy that chickens have to offer is a high price to pay for your meat. Chickens also give us an opportunity to think deeply about life and death and to respect both. Given how often death has become taboo in everyday life, that is a lesson worth learning. Every time we have taken the life of a chicken here at Hermit House, we have apologised, thanked them for their sacrifice, and petted them until they passed. They still hold a dear place in our hearts to this day. Giving a bird a good home takes work, but by doing so, you know that no matter how long you have together you gave them a life worth living, compared to a typical poultry farm where it is impossible to provide them with the individual care they need. 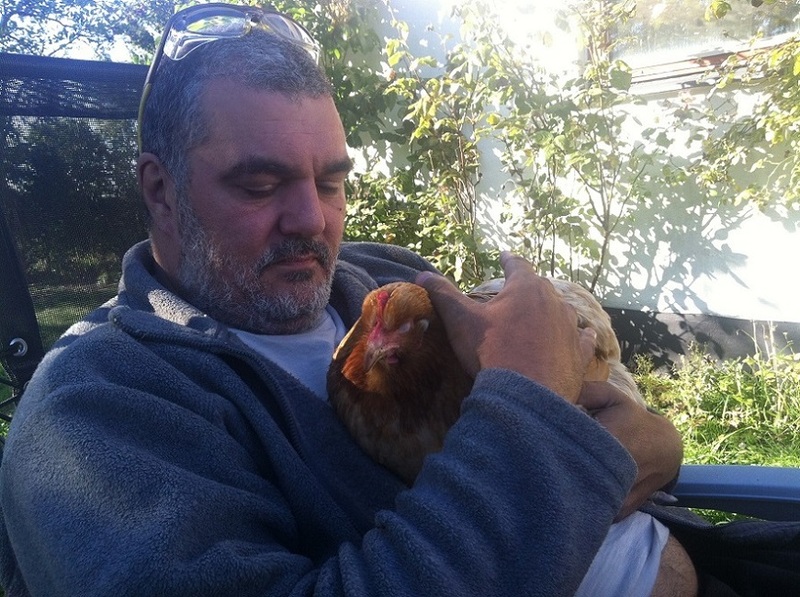 As more of us are willing to take on the role of backyard chicken keeper and deal with the difficulties and joys it brings, the higher we can raise the quality of life for the average chicken in this world, whether they are named or not. To keep chickens, or not to keep chickens, that is a far more important decision in the end run. That is our take on the subject, what are your thoughts on naming chickens? Let us know in the comments below! If you enjoyed this article then why not send our chickens a treat by donating to our homestead! We thank you, our chickens thank you! For more information, see http://hermit.house.